Nutiva Certified Organic, non-GMO, Vegan Hazelnut Spread with Cocoa, Chia and Flaxseed is a deliciously decadent treat that’s full of nutrition. 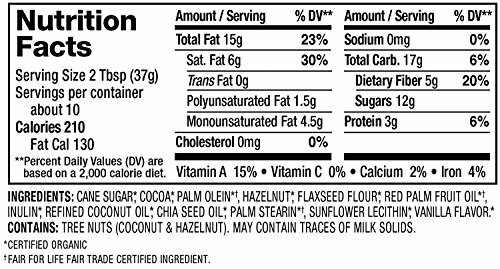 Each dairy- and gluten-free serving of Nutiva Hazelnut Spread contains 450 milligrams of heart-healthy Omega-3s, 5 healthful grams of dietary fiber, and has 40 % less sugar than some similar brands. Parents and kids can celebrate! Unlike other spreads that are processed using chemicals, Nutiva Hazelnut Spread is made using only USDA Certified Organic ingredients and can be easily incorporated into vegetarian, vegan, dairy- and gluten-free diets. Nutiva Hazelnut Spread is available in two varieties, Classic and Dark, sure to please any palate. Both are great to pair with fruit for a satisfying snack, add to smoothies for on-the-go nutrition, or simply spread on toast and savor the flavor. Nutiva was founded in 1999 with a single purpose in mind – to Revolutionize the Way the World Eats. Our role is to produce and promote organic, nutrient dense superfoods that are good for you and good for the planet. Social and environmental responsibility is a core part of Nutiva’s culture and business. From sourcing organic products, to obtaining fair trade certification, to greening our facilities and operations, to funding tree planting at schools in our local community, we are constantly seeking ways to better protect our environment and ensure a better quality of life for employees, customers, and the communities we serve.NATURALLY MADE and NUTRIENT DENSE: Nutiva Certified Organic, non-GMO, Vegan Hazelnut Spread starts with organic superfoods and blends them without the use of harmful chemicals or stabilizers, and is a source of Omega-3 fats and dietary fiber. 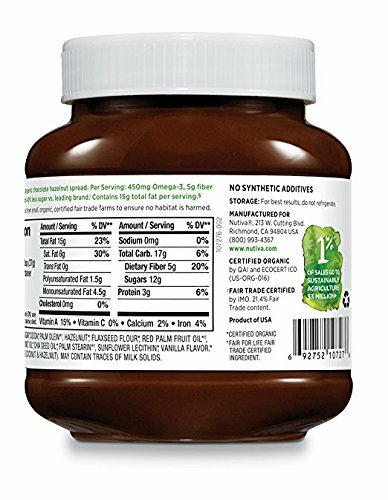 PREMIUM DIET COMPATIBILITY: Nutiva Certified Organic, non-GMO, Vegan Hazelnut Spread is an ideal addition to vegetarian, vegan, dairy- and gluten-free diets. 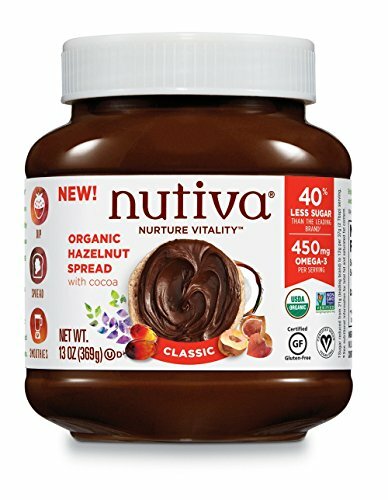 VERSATILE KITCHEN INGREDIENT: Nutiva Certified Organic, non-GMO, Vegan Hazelnut Spread is a tasty way to boost the nutrition of snacks and add complexity to smoothies, desserts and sauces. COMMITMENT TO QUALITY: Nutiva partners with organic farmers to source the world’s finest fresh, organic ingredients and stringently adheres to USDA certified organic and non-GMO guidelines to deliver superfood that is good for you and good for the planet. 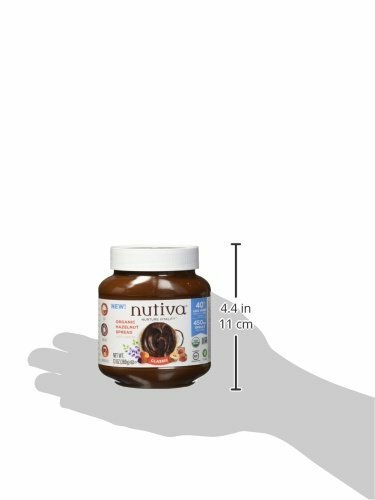 EASY TO USE PACKAGING: Nutiva Certified Organic, non-GMO, Vegan Hazelnut Spread arrives ready for use in safe, convenient BPA-free containers.